It seems to be a week for belated followup reports to earlier posts here on the Warbard. Ah, well. I finished up the Russian church at the end of January, amidst all the prep for GottaCon’s pulp game, and never did get around to posting the finished photos here. The Church of St. Boris the Intoxicated. Pardon the background, I had to take advantage of daylight and lack of rain together! …and your first look at the back, and a better look at the main roof. The whole thing wound up being 5″ long, 3″ wide and 7.5″ tall to the top of the spike on the upper dome. That’s small, but really about as big as I usually build a wargaming building. The rear view of the Church of St. Boris. 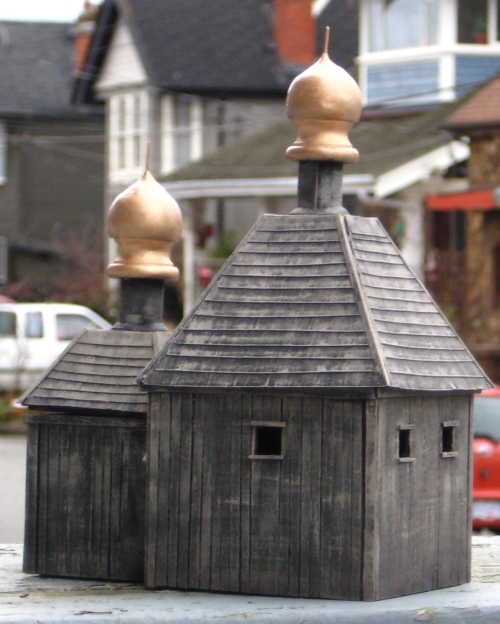 Finally, while I was finishing up the church, I threw together a small detail structure to add clutter and interested to my Russian hamlet. Behold, a pigpen. A pigpen. Oink. Or do Russian pigs say, "Oinkski"? The pigpen is random offcuts from the church project and about 2″x 3″. The mud is hot glue, from a glue gun, which is something I did as an experiment. Blob glue on, push it around before it cools. After it cools, pick the points and stringy bits off, paint brown and wash, and done. One advantage of hot glue mud is that it won’t warp cardboard or wood bases, unlike using globs of white glue. St. Boris the Intoxicated sounds like my kind of saint. Though why did I have to read this post the first day of Lent, when I’ve been called to give up booze for forty days? God has a sense of humour. 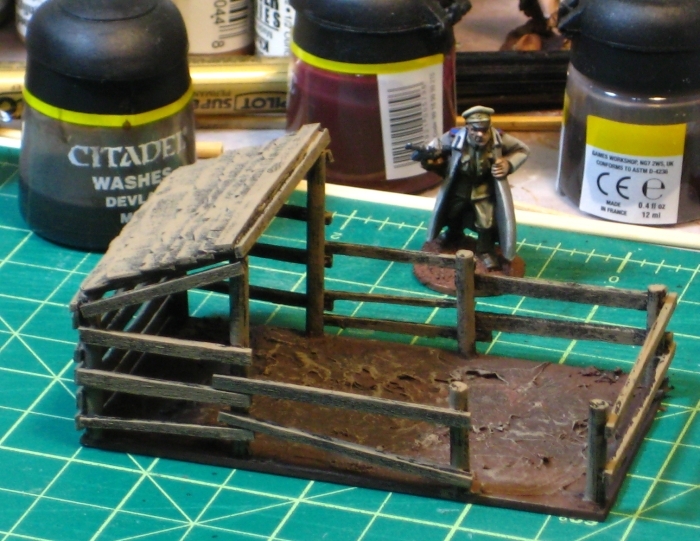 Really nice model, I love it, and I may totally steal that pigpen for ACW. So, does this mean my church now has an official priestly blessing? 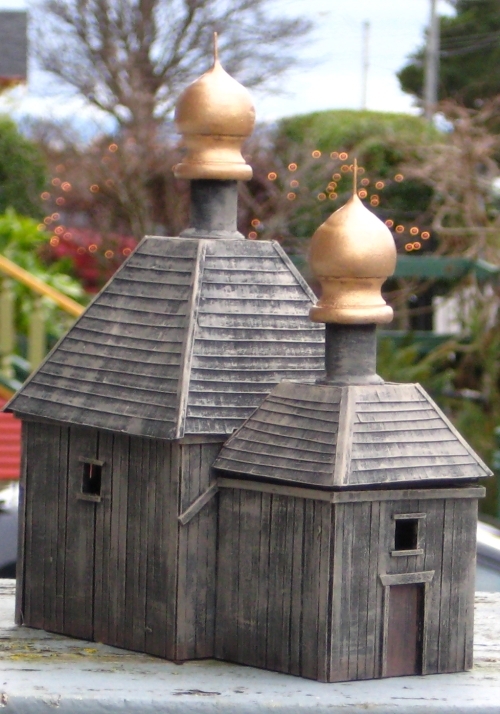 I am quite pleased with how the church came together, especially the domes, which were a chance find in the craft store. Looking lovely… Always thought about doing one myself, but the onion shapes always kept me from doing so. Doing the, from various pieces is a good idea. Will nick that idea!